As another bright, sunny day closes in this city that is not very plain and where it doesn’t much rain, Tuesday’s game suddenly is being viewed as something of a litmus test of not only Rose’s shot, which has been baroque here on the sunny Mediterranean coast, but Rose’s ability to be the great Most Valuable Player he has been. Forget it; that’s not accurate, nor reasonable. The object remains to win the game and the tournament, which always has been what’s marked Rose’s view of the games. Actually, Rose likely has passed his greatest test as questions are diminishing about his health and increasing about the appropriate level of play for him. After practice Monday in the Palau Sant Jordi (being overseas we love to pretend we can pronounce this stuff), both USA coach Mike Krzyzewski and managing director Jerry Colangelo issued a call or challenge for Rose to be aggressive against Slovenia, to break out, to be the scorer and take over player he has been before he was injured, to be that Derrick Rose. They are not looking at it like Bulls fans or management. The suspicion is they are starting to get nervous about the result of this tournament. The winner gets a bye into the 2016 Olympics. Everyone else has to qualify, which would mean assembling a team again next summer for the Tournament of the Americas in Mexico. It’s not quite Barcelona, though it sounds similar. Spain’s team with Pau Gasol, Marc Gasol and Serge Ibaka has been dominant and appears to be the favorite if the two win out and meet this weekend in the finals. While Team USA has run up an impressive series of wins with a 31-point per game winning margin, there has yet to emerge a true go to guy. 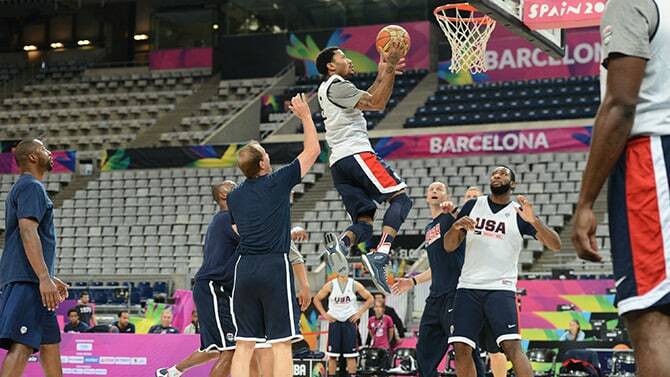 Anthony Davis leads the USA team in scoring at 13.8 per game followed by Kenneth Faried at 12.8 per game. No offense, to use the pun, but you wouldn’t throw either the ball to make a winning play. Both have scored most of their points on hustle plays, second attempts against smaller players and teams whose big men mostly play outside and in transition dunks. Neither really seems to even have much of a half court go to move, though Davis is developing a little jump shot. Neither is about to make a bigtime play inside against the Gasols or Ibaka. The only other USA players averaging in double figures are James Harden, Stephen Curry and Klay Thompson. One problem is Curry often plays with Harden and Kyrie Irving, who appear to like Curry but aren’t that enamored of passing to him, or anybody else. We’ve seen Curry create with the ball with Golden State, though he usually plays off the ball with this team. Thompson also relies on getting good spot up shots, and had a good thing going with Rose in some of the earlier games. Harden can be a finisher and make plays. He’s leading the team in free throw attempts with his effective head down bulls to the basket drive, though he also has shot poorly, about 27 percent on threes. What’s with that slippery ball? When the USA won the gold medal in 2010 in this tournament, Kevin Durant was the leading scorer and only USA player (Rose, Curry and Rudy Gay also were on the team) to average in double figures. Durant was a late withdrawal this time after training camp started. And Kevin Love, who was being counted on for scoring, withdrew before the tournament began as the trade wasn’t official yet to Cleveland. Also, potential scorers like Carmelo Anthony and LeBron James opted to remain out after playing in the previous Olympics. So, suddenly, scoring, or more accurately, a big basket down the stretch in an isolation play, is becoming a possibility that may be needed. And there haven’t been many in the lineup in the previous six games who looked like they could accomplish that. So Colangelo and Krzyzewski threw out that little challenge. USA assistant and Bulls coach Tom Thibodeau was talking to Rose long after practice Monday and feeding Rose balls in his shooting drills, which Thibodeau never does. But at the same time, what Rose heard coming into this tournament was not to worry so much about the games, get yourself in better condition, make sure your knee is good, use this to get a head start on the 2014-15 NBA season. Some Bulls fans will be looking at Rose Tuesday in the simplistic view that this is a test of whether Rose has that ability to be a high scorer again. Almost two months before the season even starts and more than seven months from the playoffs makes that notion irrelevant. This is a USA test by USA Basketball. They want to see if, as expected, their big men cannot handle Pau and Marc and Serge, is there another big scorer in there who can make plays, and thus draw the defense and create easier shooting opportunities for players like Curry and Thompson? It’s not a final concert under any circumstances. It’s a little tune up in the elaborate strumming that continues with this eclectic band. Get ready for a performance.